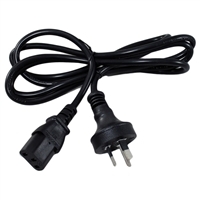 Brand new power cable to suit original Australian / New Zealand Xbox 360 console power supply bricks. Ideal if you have lost or damaged your original power cable. This Power Supply USB Adaptor Cable allows you to power and use the Xbox 360 Kinect Sensor Bar on original Xbox 360 consoles (if you have an Xbox 360 S or Xbox 360 E console you will not require this cable). Also required if you want to connect your Kinect Sensor up to your PC. This is the adaptor you need! The kit includes a 3600mAh rechargeable battery pack which fits into the back of your wireless controller (instead of AA batteries) and a USB charger cable which connects to your controller & charges the battery. This Power Supply cable set allows you to power and use the Xbox 360 Kinect Sensor Bar on an older original Xbox 360 console. Also allows you to connect an Xbox 360 Kinect Sensor up to your PC's USB port. Genuine Microsoft product with Australian plug. The perfect replacement if you have lost or damaged your original Xbox 360 Power Supply / Cable. Brand new replacement power supply for the Xbox 360 E console (Xbox 360E). The perfect replacement if you have lost or damaged your original Power Supply / Cable or if you have purchased an import console.